1. 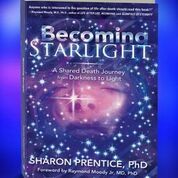 What is Becoming Starlight: A Shared Death Journey from Darkness to Light and why did you write it? Becoming Starlight is/was truly my life and death struggle with spiritual darkness and loss of faith. Having been raised within a very loving and supportive family, I was totally unprepared for the tragedy that would find its way into my life. I had no idea how to deal with life and death issues so, when death came knocking on my door and spirited away my newborn daughter, I fell into an abyss that had no end. 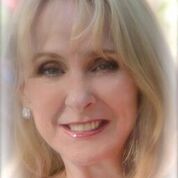 Her death, followed a few years later by the death of my husband, became the impetus for what became the most transformative moment of my life — enter the SDE (Shared Death Experience) and my night among the stars. Becoming Starlight chronicles my journey from death and despair to being held, cocooned within and becoming one with the Presence that lives in Starlight — God Himself. I wrote Becoming Starlight for two reasons. By way of explanation, I work with seriously ill, terminal patients and their families. The question they ask more than any other is “Should I be afraid”. I understand that question on such an intimate level because that is the very question that burned a hole in my Soul but one I didn’t have the courage to ask or, quite possibly one I didn’t want to become vulnerable to! When confronted with a life altering diagnosis, even the strongest and most fearless among us don’t know how to face that worst of all trauma and the darkest of all emotion in life. The fear of abandonment by God, the fear of leaving your family, the fear of falling into nothingness, the fear of losing yourself to the darkness and to the unknown — your gut responds, your jaw drops, and the true nature of your humanity emerges: mortality — and you fall. It’s a shattering loss that causes previously unknown fear and anxiety to blot out all other emotion. So, for them, I wrote Becoming Starlight. For years, I have told all my patients about my Starlight night — my SDE — in an effort to dispel some of the fear. When that question is asked, as it always is, I take each one of them in my arms, hold them tightly and tell them my story of great loss and despair and the eventual renewal within God’s presence. Giving them part of my Starlight night in hopes they will understand that they are part of all creation; part of something they do not fully understand; part of something so much bigger than themselves; something they cannot see or hear or touch or even imagine; that they are part of God himself; a part of the permanence of all Creation — to dispel the fear of losing themselves to the nothingness of the darkness is something I try to bring to them as I tell them about the light of God that I was taken into. They have all asked me to “write it down, tell the story” so they could have access to my words when we weren’t together — so I did. The other reason I wrote Becoming Starlight is because the loves of my life mattered. They were here and their lives, however short, were important. They are the shadows of my Spirit and are ever present in my life. Their story needed to be told to help others face great tragedy with hope and courage. 2. What is a Shared Death Experience? What does it feel like? How did it change my perspective? The SDE is almost identical to the NDE except that the SDE occurs not to the person who is dying, but to their loved one who is physically well. That person could be sitting right next to their dying loved one, or sitting across the room, or even be across the globe unaware of the impending death of someone they love. They could be sound asleep or wide awake — makes no difference. Location or activity level is of no consequence to the SDE. That person is “invited along” to witness the aftermath of physical death. The invitation extended has no RSVP — the person accompanying the dying individual can neither accept nor refuse — they are just “taken” or “given” the experience. The experience itself is mind altering as it causes a complete shift in the attributes of the physical world as we know it. By that, I mean the room changes shape as it eventually disappears; the ceiling vanishes and becomes mist; the floor upon which you are standing is no longer visible; you find yourself no longer in the physical world as you have always known it. You see all manner of magnificence..and you can see and hear and touch the person or persons that “brought” you with them into another realm of being. Confusing, exciting, amazingly peaceful and calming all jumbled up with joy and unimaginable love…all directed at you. These experiences are life altering. Everything I thought I knew about life and death, about love and God, about what happens after physical death-was all wrong! My SDE changed everything about my life and changed it radically! The belief/religious traditions of my entire family changed because of my SDE. I found that what I had believed in all my life was diametrically opposed to what I “saw” and “felt” in that place within Starlight. Discovering that I was a part of God…that He lived in me and I in Him…that He is not separate from us and that there can never be a separation from Him-changed my life. 3. The book talks about a wide range of emotions and experiences including a fall from grace and inconsolable rage. Can you talk a little bit about those emotions and experiences. What sparked them? Were they helpful or hurtful? And, what did you learn from them? In Becoming Starlight I try to explain the emotional trauma that hit me square in the face when I lost my daughter. All my life I had been taught that God was watching over me and that He would protect me from harm. I believed if I behaved in a certain manner then HE would do likewise..I discovered that belief to be absolutely false and, when my baby girl died — I blamed God. Having never been exposed to tragedy in any way whatsoever-I was completely defenseless against death — I had no idea what to do, how to behave, how to understand this, who to talk to, who to share my emotions and thoughts with, where to go for help-nothing..no idea whatsoever how to handle her death. My only response was anger..extreme anger which turned to rage. Frustration at life and living turned inward and resulted in an inconsolable despair that tormented me constantly. I simply did not understand why or how God could take a little baby and leave such desolation. The God I had been taught about; ie that most benevolent, all loving, caring, compassionate God who takes care of “His children” simply did not exist. And, if there were a God at all — he was a vengeful, hateful evil “thing” that I would spend the rest of my life fighting against. Nothing could sway me from my intended goal of destroying anything that even smacked of a loving compassionate God. Grief and despair borne of hatred, frustration and rage turned inward almost destroyed me. A few years after my daughter’s death, I lost my husband. During his illness, my rage at God or at that “thing” I considered God to be escalated to a frenzied state that left me in a constant state of fear and anxiety. Not knowing how to handle these raw emotions and not having anyone to share them with was almost unbearable. These negative emotions took such a toll on my physical well-being and left me gasping for air but knowing that I had to maneuver myself through the loneliness and despair in order to help and offer “hope” to my husband, I somehow had to find the strength to keep going and keep breathing. That strength didn’t come easily..I still don’t know how I managed to physically and emotionally survive all this …but it was the intervention of God Himself — at the moment of my husband’s death — His gift, granted to me through magnificent love, in the form of a Shared Death Experience that brought me back to life and love. Being gifted with a new-found relationship with the God that I always wished existed but had never known in my entire life set me a path to living a life that was full of joy and peace…dispelling the rage and despair from my heart. Discovering that I existed purely because He thought of me…and then gave life to that thought..was thrilling beyond measure! Knowing that there is nowhere that He is not and that there can never be a separation from His love sent all loneliness packing and left me with a peace beyond all else. 4. Why do you think there is such a fear of death if most people believe in an afterlife where we will exist in a state of peace with our loved ones? Most people say they believe in an afterlife. Most all religions and belief traditions have some version of a Heaven and a Hell. And, as comforting or terrifying as those traditions may be, and as much as we say “we believe” —when the time comes for us to face death — those belief traditions can falter and leave us in a state of complete shock and fear. How best to alleviate that fear? That’s a difficult question. We are born with such an innate self-preservation instinct that, when confronted with danger — the fight or flight mindset takes over our every thought and action. We spend our lives in denial of our own mortality and of those we love. “Don’t worry, that’s not us” or “That stuff happens to the other guy” seems to be the mantra in times of difficulty and fear. The fear of death is, next to public speaking — the number one fear of all humanity. Why? It’s the great unknown! If we look at the fear experienced — it’s the fear of the darkness, the void, the unbecoming, the nothingness — the fear of disappearing into the blackness and the “what’s out there?” We can’t imagine ourselves as “not here” or “not anymore” and that thought can be terrifying. Losing oneself to the “nothingness”, dealing with something so foreign and unknown as death — that fear cannot simply be pushed aside by “I believe in an afterlife”. Especially when that belief is based on nothing more than family tradition passed down and never questioned. We never talk about death to each other, to our children, to our friends — as a matter of fact — we don’t talk about death at all! We fill out our medical directives, choose our proxy’s then put them away where they lay forgotten —sometimes for years. Why? Because truly contemplating our death requires entering a realm of emotion previously untouched and unacknowledged -– a realm that is protected by that giant self-preservation instinct that keeps us safe from knowing that loss of self is even possible! Talking about it, sharing it, truly feeling it is something none of us want to do-so we hide behind the “I believe” statements as if they will be our lifeline and grant us immortality. The belief in an afterlife fundamentally changes when illness and possible death enter the equation. It’s so easy to say the words but very difficult to live those words when a belief statement is based solely on family tradition. The source of that fear comes from a never fully realized relationship with belief! If, however, there have been some conversations surrounding the “what if’s” of life — those conversations make it much easier for one to express the fears they feel. Getting those fears and anxieties out of the body, out into the open is all important and can help to alleviate some of the fear and anxiety. The fear of death is primal. You can say “I believe” constantly but the innate fear of losing oneself to the unknown still remains and the doubt — the doubt is the ego’s way of laying claim to the humanity that we all share. We don’t understand death. We don’t look at it nor do we accept it as part of life. And something we don’t accept — we push aside and never look at so, when we are confronted with it — we have no idea how to feel or behave or what to believe! Remember, even Jesus Christ Himself suffered anxiety and tremendous fear while in the Garden of Gethsemane. And He really believed! 5. How can we decrease or better manage our fear of death? The only possible way to decrease the fear of death is to talk about it, face it, and deal with it! Facing all the negative emotions that raise their ugly heads is difficult at best. But, denying them only leads to more fear and anxiety. Refusing to surrender to the mortality that is inherent in all life instead of facing it down, plowing through it, grabbing it by the throat and introducing yourself wholly and fully, with all your flaws and fears up front and growling — refusing to confront the realities of life — is a good way to lose yourself to the darkness. You must travel through those realities to find your way out of the maze of fear that has you by the throat. To enter your Soul you must confront all the human thoughts and nonsense you have been exposed to all your life and start the “ripping off” process — it’s there that fear can be unearthed and dealt with. You must challenge yourself to look deep inside your Spirit to find the truth of who you really are and the truth of your mortality — that’s where “I believe” lives…and that “I Believe”, based on more than tradition, dispels the darkness and the fear of the unknown. Once you discover your true self, in and of God-fear cannot survive. There’s always something else, isn’t there! Especially when death and fear run rampant in our hearts. Letting fear take over your life leads to such an emptiness — one that is so very difficult to get through. The feeling of complete and utter desolation…and loneliness …can only be dispelled by one thing when we are facing our death or the death of someone we love — and that one thing is discovering the complete, overriding and always present love of God. Learning to trust in the abiding Presence and ever constant communion with God even in the darkest of times and the cataclysms of life can strip away the fear and anxiety that accompanies all disease and loss of life. Sitting quietly in His Presence, taking in the truth of who we are to Him and who He is to us; allowing yourself to sit in the silence that is His gift to you; being in that place where love was born and where darkness cannot enter — fear doesn’t stand a chance! Please know that you are never alone. There can never be a separation from God. Nothing on this earth or any other could ever separate you from the love of He Who thought of you and then breathed life into that thought. And remember-death is merely the door that opens the way back to home. Belief in an afterlife — the afterlife is simply going home!